Around 4ish, I was at the train station, sitting next a lady and she suddenly turned round towards me and said 'I love your jumper, where is it from?' I instantly started to laugh because I bought it for about 80p at East End Thrift store, the BEST vintage sale ever! If any of you are ever in London you absolutely must try to go to their fill a bag sale where you can stuff as many clothes into a bag as possible for £10 or £20 depending on size. The lady said she loved my whole outfit which made me so happy that I couldn't stop smiling for my whole train journey. 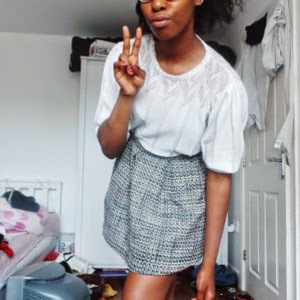 I bought my skirt from New Look but it was in the sale quite a while ago so probably isn't available anymore. I love this skirt and have been wearing it so often recently because it's so versatile. My beloved Birkenstocks are from Topshop and are only £25! They're super comfy and come in black and white so pretty much go with any outfit. Thanks so much :) I love your blog! I don't blame her for noticing, that neckline detail caught my eye instantly. Also, isn't it great when people compliment you on something that looks great and you got it for mere pennies? Thrift shopping all the way! Thank you :) I love thrift shopping! 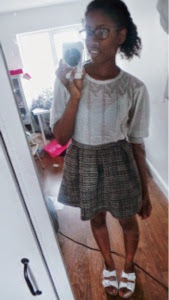 this outfit is so cute! 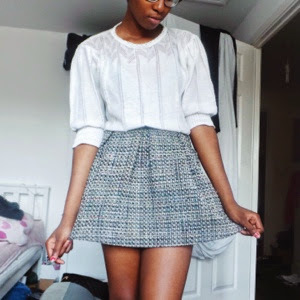 I love the EETS, I got a skirt from there for less than a pound and it's so much cuter than all my more expensive skirts.